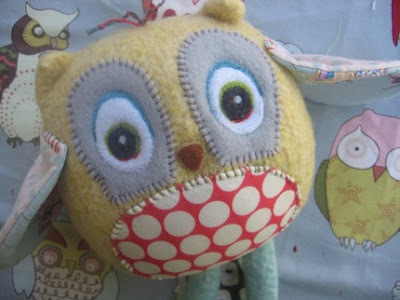 Maureen Cracknell Handmade: Owl doll. Owl details. I realized it's been a while since I've shared any new dolls. So, this here is my latest custom order request to come through my etsy. 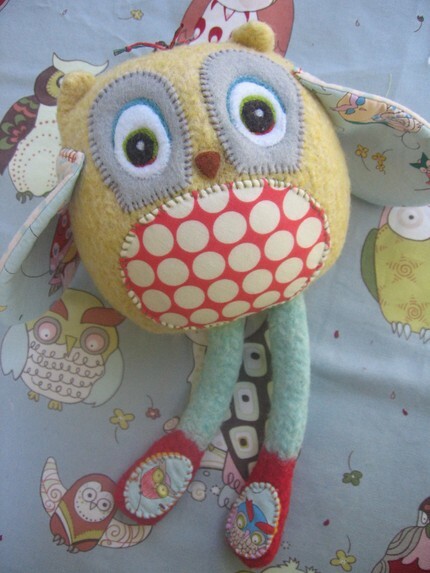 Created to be a special doll for a babe on the way with a nursery waiting for him/her decked out with this Alexander Henry -- "It's a Hoot" fabric. I wanted to make a similar doll to the last one I blogged about --- with that sweet, bright eyed, baby owl face. With lots of "It's a hoot" fabric details. Oh yes, I love this fabric! 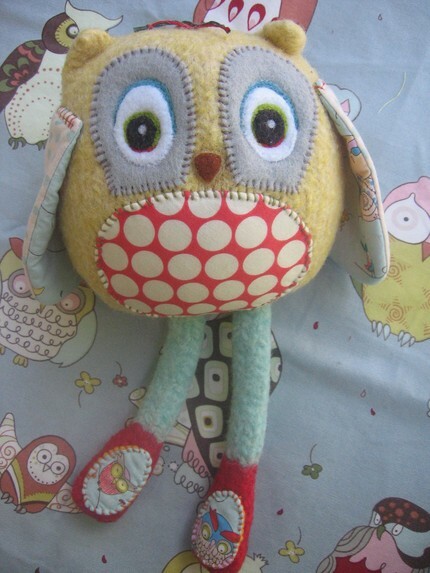 I still have an owl embroidered pillow, with this wonderful fabric, still available. 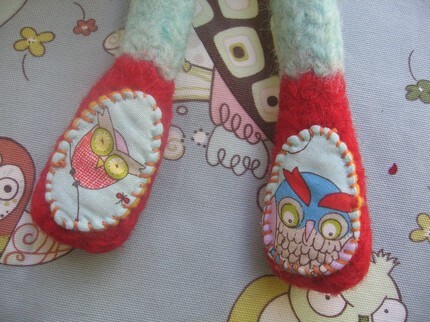 And, a few more owl dolls that I am almost ready to share. Adorable owls you have there. These dolls are sooooo cute! Love them. Oh my what a gorgeous owl! I just love owls and yours was AWESOME!! I cannot handle how CUTE this owl is. 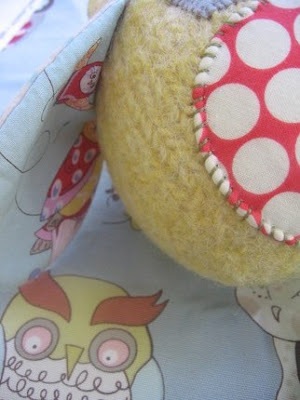 That blue owl fabric is my all time fave! The cuteness of it!! Gotta be the cutest thing I've seen in long while! This owl looks so surprised... love it... so cute. A-D-O-A-B-L-E!!! I Love it! I found you on etsy and I don't have a blog, but I love yours. Aaah it has the cutest face and I love the feet. I'm sure this owl is going to be treasured. Another cute owl! I'm sure the baby receiving your doll will cherish it. Awww, that owl is too cutte! oh my! i love love this! adorable :D i love love the feet. Thanks to everyone for all sweet comments! I was worried after my "break" that I'd be alone here for a while --- you've all made my day! That is so gorgeous, I LOVE the feet! It is a very cool doll! Any child would love it...grown ups too! I think you will love "One Yard Wonders"...you really must get it! That owl is to fie for cute! Oh, these are so sweet :) I love owls. Thanks for visiting my blog the other day. Have a great weekend!